Germany is such a compact country that, unless you're going from Munich to Hamburg, taking the train will probably be the more convenient and (in my opinion) enjoyable mode of transport. In general, domestic air travel is geared mainly toward business travelers and therefore flying is not generally a popular means of travel within Germany. However, you will most likely arrive in and depart from Germany by air, and you may need to make a short hop from your initial arrival point (probably Frankfurt) to some other destination, or vice-versa, so here's what you'll need to know. There are 35 or so commercial passenger airports (Flughafen) in Germany, with Frankfurt and Munich being the two biggest. 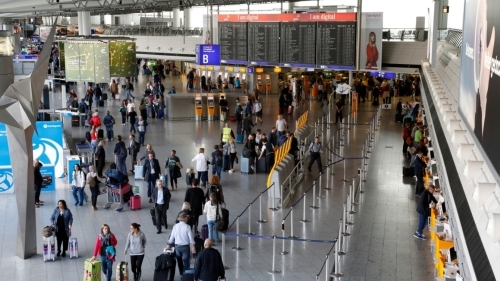 Altogether, over 215 million passengers were facilitated by German airports in 2014, with just under 100 million of those in Frankfurt and Munich alone. Düsseldorf, Berlin-Tegel, and Hamburg, also had over 10 million passengers each, with Stuttgart just under that threshold. A new airport to consolidate Berlin's two remaining airports is being built adjacent to the existing Schönefeld Airport. Originally scheduled to open in 2010, a series of construction problems, mismanagement, and corruption have delayed the opening repeatedly. Corrective and retrofitting work now underway will likely prevent an opening any time before 2019. The project has sadly been nothing short of a national embarassment for a country known for its efficiency and oversight. 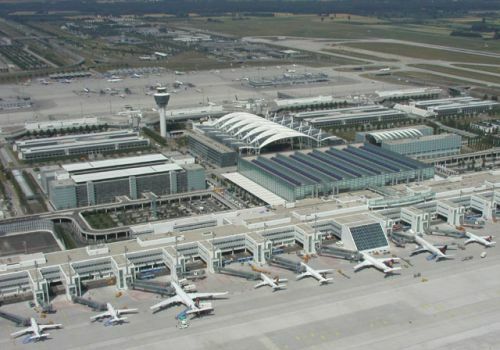 Airports in Germany are operated by government-franchised private companies. The company that operates Frankfurt airport also operates several other airports around the world. 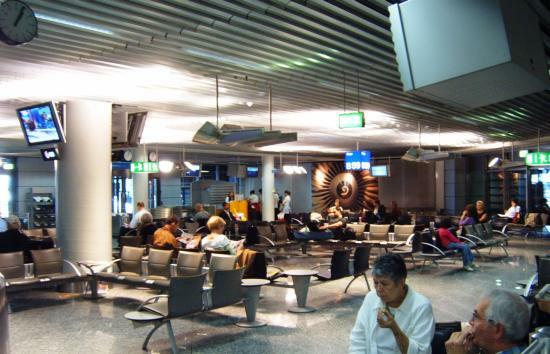 German airports are generally clean and efficient and feature the typical duty-free shops, restaurants, bars, car rental agencies, conference centers, banks, and other services one would expect to find in modern western airports. Frankfurt's airport even boasts such services as a supermarket, clinic, dentist, and kennel. Arriving in Germany is fairly simple and straightforward. If you arrive on an international flight, you will be directed from the arrival gate first to passport control (Passkontrolle). If you are from the US or other non-European nation, use the "Non-EU National" line. After having your passport stamped, you will then proceed to baggage claim. Once you collect your bags, you proceed through the customs area (Zoll). If you have something to declare, use the lane with the red sign. Otherwise, proceed through the lane with the green sign where you will alight in the landside area of the terminal. If you are meeting someone, this is likely where they will be waiting for you. 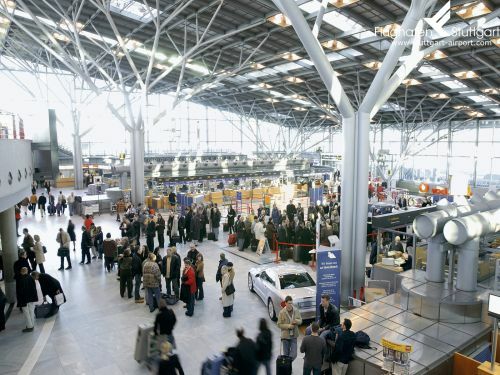 If you are the one meeting someone who is flying in, remember that the airside section of German airports is highly secure and only ticketed passengers and airport workers are allowed in the gate areas and concourses, so you will have to meet your party in the landside area of the airport. To do so, check the arrivals board (marked Ankunft) when you get to the airport to determine which arrivals exit your party will be using, then wait near there for them. If the green lights next to the flight on the arrival board are flashing, it means that the flight has arrived. Alternatively, you can plan to have your party meet you at an officially designated meeting point (Treffpunkt) found in most airports. While arriving is pretty easy, flying out of a German airport is much more elaborate. First, you should plan on arriving at least two hours before your flight. 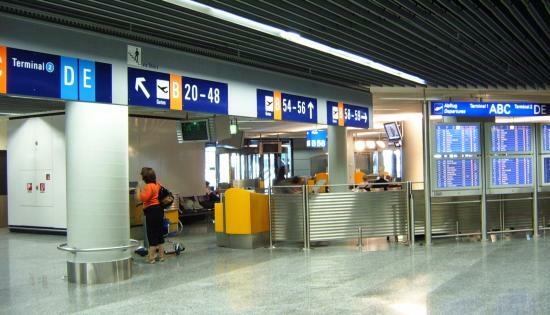 When you arrive at the airport for an outbound flight, you will first need to check the flight information displays (marked Abflug) for two pieces of information: the check-in counter (Schalter) numbers and the gate number (Flugsteig) for your flight, as well as the current status of the flight. If the green lights next to your flight are flashing, it can mean that they've either started check-in or started boarding depending on where you are in the airport. In Germany, ticketing and check-in counters are numbered. The numbers are usually located above the counter. You must use one of the counters noted on the flight information display for your flight and can only do so when check-in for your flight is open. Usually, several counters handle check-in for all flights for an airline, but sometimes specific flights must check-in at a specific counter. Security is very tight, especially for international flights, and you will have to go through several layers of security checking. Be prepared to play "20 questions" with several airline and airport security personnel. You will be asked repeatedly about your luggage and travel plans. Unfortunately, sometimes the questioning takes on the rather no-nonsense tone of an interrogation, but just answer their questions accurately and politely and you'll soon be on your way. Don't worry if you don't speak German-- you can ask to be questioned in another language. Besides rental cars, there are usually a plethora of public transportation options to get from the airport to the central city or beyond. Listed below are the major German commercial passenger airports with connection information to the central railway station (Hauptbahnhof, "Hbf"), city center, or other important destinations as indicated. The major international airports are highlighted. Because you will most likely encounter Frankfurt's airport in your travels to Germany, I have included a special write-up on it below the other listings. Be sure to see my pages about renting a car, urban public transport, taxis, and rail transport for further details of using those transportation options. All information was correct as of May 2016 and is subject to change without notice. Check the websites of the individual airports (links at the bottom of this page) for up-to-date information. JetExpressBus TXL to various city locations every 10-20 min. Tram 6 to Hbf every 10 min. S-Bahn S1 to Hbf every 10 min. S-Bahn S5 to Hannover Hbf every 30 min. S-Bahn S13 or S19 to Köln Hbf every 15 min. Bus SB 60 "Airport Express" to Bonn Hbf every 30 min. S-Bahn S5 to Leipzig Hbf or Halle Hbf every 10 min. S-Bahn S1 or S8 to Hbf every 10 min. Lufthansa AirportBus to Schwabing Nord and Hbf every 20 min. U-Bahn U2 to Nürnberg Hbf every 15 min. S-Bahn S2 or S3 to Hbf every 15 min. Serving over 64 million passengers in 2017, Frankfurt Rhein-Main Airport (FRA), also known as Frankfurt International Airport, is Germany's busiest airport and 13th busiest worldwide. For a long time Europe's second busiest, it has slipped to fourth in Europe behind London Heathrow, Paris CDG, and Amsterdam Schiphol. In addition to being the world hub for Lufthansa, Rhein-Main is served by 103 other airlines with about 700 daily departures to 297 destinations in 104 countries-- the most international destinations of any airport. Transfers account for over half of the passenger count, making FRA one of the world's most important international air hubs. Given these superlatives, it should be no surprise that the gargantuan facility is currently operating near capacity. A new runway that opened in 2011 and an expansion of concourse A completed in 2012 have helped alleviate congestion and provided room for the airport's continued growth. Construction is also underway for a future third terminal to be located on the southern side of the airport on the former US Air Force base; it is expected to open in 2022. Additionally, FRA was the first commercial airport in the world to be certified for the monster Airbus A380 superjumbo jet; the aforementioned concourse A expansion as well as the recently-upgraded concourse D both have gates designed to facilitate the A380. Beware that there is a second "Frankfurt" airport, the much smaller Frankfurt-Hahn, which is used exclusively by discount airlines. Calling it Frankfurt-Hahn is a cruel trick, however, as it is laughably located 105 km (65 miles) west of Frankfurt and is actually closer to Luxembourg and Bonn than to downtown Frankfurt. 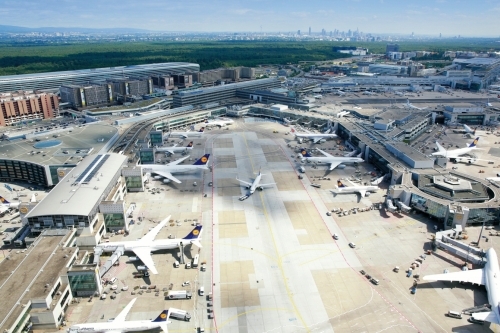 Located just 9 km (6 miles) southwest of downtown Frankfurt (about 15 minutes by rail, a little longer by car), the airport is a monolith comprised of two terminals and a small city of support facilities. Gates, arrival areas and check-in counters carry the concourse letter followed by the number (i.e. Gate C5, Counter A202, etc.) The letter is usually dropped from the numbers on signs at the check-in counters, but not at the gates. When looking for your gate, follow the signs for the lettered concourse first, then look for signs for the gate number once you reach that concourse. On some signs (but not all), the concourse letters for Terminal 1 are in orange while those in Terminal 2 are in light blue. The non-European international gates on the upper level of concourse A were relabeled as "Z" in late 2011. This was done ostensibly to create logical numbering capacity for the concourse A addition that opened in 2012. The terminals are divided into the public landside area and the secure airside area. To enter the secure area, you must have a valid boarding card and pass through the security screening. The airside area of the airport is further divided into two control zones: the "Schengen zone" for domestic German and most European flights, and the "transit zone" for international flights. (The Schengen Agreement allows for travel between most European countries without passport controls.) To move between these zones, you must go through a passport checkpoint. Unfortunately, having these different zones does confuse things a bit. 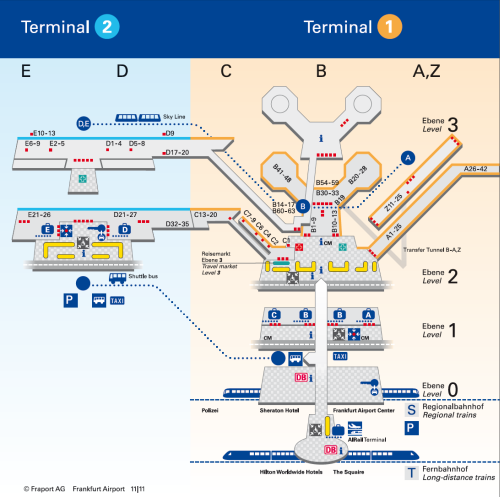 Most of level 2 of concourse 1/A, the front half of concourse 1/B, the far end of concourse 1/C, and level 2 of Terminal 2 are in the Schengen zone; the remainder of the airport is in the international transit zone. 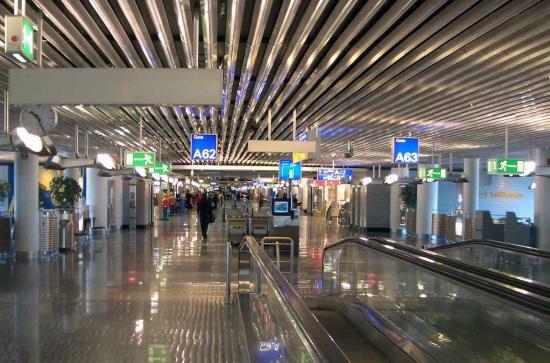 For the most part, the airport is arranged so that you only have to pass through passport control if you are crossing between zones; if you are connecting from one international flight to another, you should not have to pass through any immigration checkpoints. However, be aware that there are additional security checkpoints within the secure zone, and flights to some countries (including the US) may require an additional security screening even if you are just connecting, so be prepared to go through an unexpected security check. "Just follow the signs. Don't think. Don't apply logic. Just follow the sign. You will get to your destination. You might have to go through security 2-3 times, customs, passport control, tunnels, escalators, elevators, stairs and you feel that you have just walked to your final destination. But under no circumstances try to make sense of it. You will only get lost." Being such a large and complex airport, distances can be long-- really long in some cases-- especially if you have to change terminals or concourses. If your gate is at the end of the 1/A or 1/Z concourses, or if you use the long-distance rail station (or both of the above), get ready for a long hike, even with the moving walkways. A walk from the far end of concourse 1/A to the opposite end of concourse 2/E is a distance of 2.6 km (1.6 miles)! There are several information counters around the terminals to help you with employees dressed in red uniforms. As in most places, the competence and disposition of the staff can vary widely, but most of the time you'll find helpful and informative workers (if not overly friendly) who speak English and other languages. If you encounter someone unusually surly or obviously lacking the information you need, just go find someone else. Keep in mind that German service workers inherently dispense with pleasantries-- Germans typically regard overt cheerfulness as fake or feigned. The biggest complaints about rudeness seem to be about the security personnel, so just be cooperative and impassive and you'll be on your way. Because of terminal capacity issues, many short and medium haul flights use remote parking spots away from the terminal and passengers are bused between the plane and terminal. In fact, about half of the airport's gates are these so-called "stand" gates. One of the quirks about this airport is that there seems to be passageways, gates, and service facilities tucked into obscure nooks and crannies everywhere, so much so that it really can feel like a disorganized labyrinth. This is especially true in Terminal 1 which has been expanded and reorganized several times over the years. Many gates require you to go up or down a dedicated escalator or staircase, the entrances to the tunnel between concourses 1/A and 1/B are surprisingly inconspicuous, and some restroom entrances look more like closets. Again, carefully watch for and follow the relevant signs. If Tom Hanks' character in the movie The Terminal could choose an airport to be stuck at, this would be a good choice. This self-contained city has large shopping and eating areas and plenty of additional services. Indeed, FRA is arguably one of the best airports anywhere in this regards-- it's practically a shopping mall that happens to have an airport attached. There are a multitude of stores (over 200 of them) carrying books, perfume, jewelry, clothes, leather goods, electronics, toys, souvenirs, liquor, candy, convenience items-- even erotica. In December, you'll also find a traditional-style German Christmas market on the mezzanine in Terminal 1. Even more good news for shoppers-- the law requires businesses to maintain typical street prices in their airport outlets. If you're hungry or thirsty before or after that long flight, you'll find over 70 restaurants, cafes, and bars catering to every taste: fast-food (including the ubiquitous McDonald's and Starbucks), traditional German food (including a beer garden), pizza and pasta, ice cream, sandwiches, Asian cuisines, sushi and even hoity-toity French fare. There are also several bakeries and even two supermarkets for the do-it-yourself types. If you have medical needs, there are several pharmacies, a medical clinic, optician and even a dentist. Other services to be found are hair dressers and barbers, a tailor and dry cleaner, a conference and business center, and a kennel if your dog needs some time to relax. To pass the time, you'll find a visitor's terrace overlooking the airfield in Terminal 2, nine children's play areas, chapels and prayer rooms, and art . (The casino closed in 2014.) And, of course, you'll find banks and currency exchanges, post offices, insurance agents, and car rental and travel agencies as well as 26 airline lounges. Elsewhere on the airport grounds are a couple of hotels, gas stations, and train stations. Tired of lugging all that luggage around? There are lots of free baggage carts. Unfortunately, in most cases, they can no longer be taken on the escalators or moving walkways nor on the Sky Line. For long layovers, there are baggage storage offices in each terminal. Throughout the airport, you'll now find electronic kiosks with airport information. If they're on the fritz, or you'd just rather talk to a human, there are several information centers in each terminal staffed by red-uniformed employees. 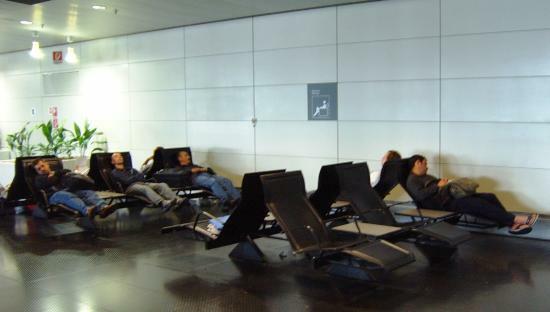 Looking for a place to relax or snooze between flights? There are several "leisure zones" scattered around equipped with reclining chairs. One of the best is in concourse 1/B, level 3 along the walkway to concourse 1/C. Of course, if you have a bag with you, be sure you secure it to your person in some way before you doze-off so it will still be there when you wake. If yoga is your preferred form of relaxation, there are two yoga rooms as well, one in concourse 1/C and the other in concourse 2/D. Finally, if your electronic device needs a charge, there are dozens of charging stations throughout both terminals. All that said, the airport does have some pitfalls. A common complaint is about small and sometimes not-so-clean WCs, although in my experiences I've never actually witnessed this. Also, many of the shops and services are located in the big shopping arcade in the landside area of the Terminal 1, so transit passengers have to clear passport control to use them, then go back through security and passport control to catch their connecting flight. There are virtually no services in concourse 1/C. While most of the terminal areas have now been designated as non-smoking, the smoke from the smoking lounges (and there are a lot of them) can sometimes waft considerably further afield. Given the age and extent of the facilities, there are always renovations going on somewhere in the terminals. It seems like they just keep rotating the construction work through each of the concourses every few years. Even with the constant work, a few areas of the airport are still rather dated and depressingly dingy, although that's gotten better in recent years. And more than once I've been in areas where the heating system has been working too well. Finally, if for some reason you have an aversion to shiny stainless steel, stay out of this airport-- it's everywhere. When you arrive, you will be discharged into appropriate control zone (transit or Schengen). For transit passengers, see the "Connecting flights" section below. For those arriving in the Schengen zone, you simply claim your bags (if any) and leave the airport. Passengers arriving in the transit zone will first have to pass through the passport control area where you simply present your passport for inspection and the obligatory stamp (which the Germans of course take to a whole other level.) Note that there are different lanes for EU and non-EU nationals, so be sure you get in the right line. Depending on when you arrive, there might be a considerable wait to get through passport control. If you don't have any bags to claim, it might be faster to use one of the passport checkpoints located in another concourse. If you are trying to catch a connecting flight and must go through passport control, most of the checkpoints now offer a "Fast Lane" for passengers on upcoming flights; the flights for which passengers can take advantage of this shortcut are listed on a display above the lane. After clearing passport control, you can proceed to baggage claim. From the baggage claim area, you then must pass through a customs checkpoint. If you have nothing to declare or are coming from another EU country, this is generally a non-event-- just proceed through the "green" line and you won't even have to say anything to the inspector unless you are stopped for a random check. (Don't ask me why the sign for green line is actually shaped like a stop-sign.) After clearing customs, you will unceremoniously alight in the main landside zone of the terminal. If you are meeting someone, they should be waiting here. Otherwise, follow the signs to head to public transport (see below), taxis, or the car rental desks. There are numerous local, regional, domestic and international rail connections to and from the airport's two (yes, two) railway stations. From the regional station (Regionalbahnhof) beneath Terminal 1, S-Bahn S8 or S9 goes to downtown Frankfurt in less than 15 minutes, as well as to Mainz and Wiesbaden. The sparkling long-distance rail station (Fernbahnhof), connected to Terminal 1 by an agonizingly long skybridge over the adjacent Autobahn, serves mainline GermanRail trains to many domestic and international destinations. If you arrive at Terminal 1, follow the signs to the appropriate station. If you arrive at Terminal 2, take the direct shuttle bus to the stations or take the Sky Line train to Terminal 1 and follow the signs from there. GermanRail has two ticketing and information centers (Reisezentrum), one at the long-distance station and the other just above the regional station in the underground shopping area (Level 0) near the center of concourse B. In additional to rail service, there is also regional bus service to several area towns including Darmstadt and Rüsselsheim. There is also direct bus service to Strasbourg, Mannheim, Heidelberg, and Talheim. Most buses leave from the bus station at Terminal 1. From Terminal 2, take the Sky Line train to Terminal 1 and go down to the arrivals level. From Terminal 1, the bus station is located directly outside of the terminal. All of the major rental car agencies have counters in both terminals. Taxis can also be hired from either terminal. There is 24-hour taxi service to Frankfurt, Wiesbaden and Mainz. A taxi ride to downtown Frankfurt will take 20-40 minutes depending on traffic and should cost about €20. You should plan on arriving at least two hours before your scheduled departure. If you arrive by car or train, follow the signs for departing flights. If you must return your rental car, follow the signs for rental car returns. If you arrive by rail at the long-distance station, check to see if your airline has a counter there. If so, you can check-in there and then proceed directly to security and on to your departure gate. Otherwise, once in the terminal, check the large flight display boards for information on the check-in counter and gate for your flight. Then proceed to the appropriate counter to get a boarding pass and check any bags. 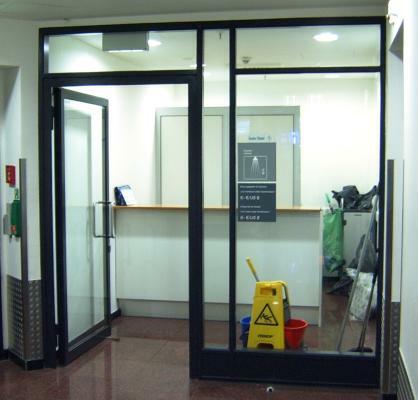 From there, you will be directed to the security checkpoint for your departure hall. Proceed through the security and passport checkpoints and then follow the signs to your gate. Be aware that passengers headed for the US, UK, and Middle East face more intense screening nowadays, so be prepared to put-up with a bit more hassle than you may otherwise be expecting. If you are passing through Frankfurt to and from non-Schengen countries, your transfer will take place entirely within the transit zone and you should not have to go through customs or passport control. If your connecting flight leaves from a different terminal than the one you arrive in, the Sky Line train will allow you to make the transfer while remaining in the transit zone. Transfers between non-Schengen and Schengen countries (including Germany) will require you to go through passport control. Unlike many international airports with a single immigration area, you will find passport checkpoints in each of the concourses. However, you shouldn't need to seek one out-- just follow the signs to the gate for your connecting flight and it should lead you to a checkpoint. If you are connecting to another flight with a short connection time (typically less than 45 minutes), you should be able to use the "Fast Lane" service at the passport control stations; eligible flights are shown on a display above the "Fast Lane" counter. After clearing passport control, you can then proceed to the gate for your connecting flight. Be sure to check the flight information displays for the latest gate number as flights are sometimes moved to other gates due to late or early arrivals. If your connecting flight is in the other terminal, use the Sky Line train. A tunnel allows you to transfer within the Schengen zones of concourses 1/A and 1/B so that you do not need to leave the secure area; use the elevators near gates A15 and B19. There is also a passageway inside the secure zone from concourse 1/B to concourse 1/C on level 3. If you need a boarding pass or additional assistance, check-in at your airline's transfer counter first thing after arriving. Lufthansa advertises a guaranteed connection time of 45 minutes at FRA. However, based on experience, an hour is probably more realistic if you're staying within the transit or Schengen zones and 75 minutes if you have to cross between them. Flights from North America to FRA often arrive early, but don't count on it as any time savings gained from that strong tailwind are frequently lost due to congestion in Frankfurt's approach and landing slots. 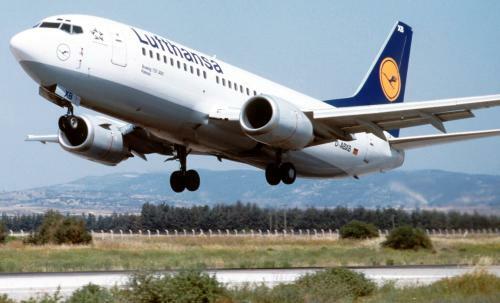 The major domestic airline in Germany is Lufthansa. It connects all of the major airports with at least four flights daily. Most domestic trips are an hour or less in duration. Lufthansa also has a high-speed rail line, the Lufthansa Airport Express, which provides links from Frankfurt and Düsseldorf airports to Stuttgart, Bonn, Cologne, and Dortmund. Germany, and Europe in general, have been invaded by a number of discount carriers in recent years, including Condor, LTU, Hapag-Lloyd, Aero-Lloyd, Eurowings, and Deutsche BA, a subsidiary of British Air. German airlines transport 50 million passengers a year. About 90 other international airlines have regularly scheduled flights to Germany, including all of the major US carriers. From Germany, connections are available to over 300 destinations in 90 countries worldwide.